Do You Want To See What Valencia Looks Like? 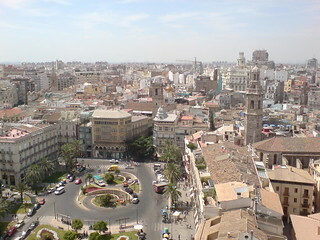 Valencia is Spain’s third largest city with a population of over 800,000. Valencia web cameras are set up all around the city beaming live footage direct to the Internet so you can see how the city looks from your computer. As well as a list of all the cams you can also take a guided tour of the city of Valencia and the most famous sights by viewing this high-definition video below – the music is awesome too! Valencia is situated approximately half-way down the east coast of Spain. The international airport makes it a gateway to the northern Costa Blanca to the south of the city and the Costa del Azahar to the north. But there is so much to see and do in Valencia, why leave the city? 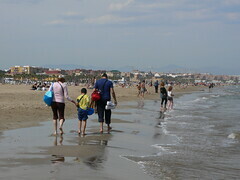 Well people leave for the lovely beach resorts but even the city has beaches. Most importantly it is rich in sights and history which can be traced back to 137BC. Visit the Valencia Cathedral which was built between the 13th and 15th centuries and is mainly Gothic in parents with elements of Baroque and Romanesque architecture. The silk exchange market (La Lonja de la Seda) has been recognised as a world heritage site by the UNESCO organisation. 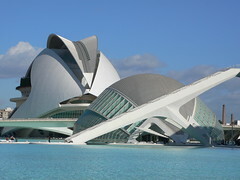 The City of Arts and Sciences attraction (Ciutat de las Arts I les Ciênces) designed by Valencia’s own Santiago Calatrava is a must-see with a number of different buildings including the L’Oceanogràfic, the largest aquarium in Europe which is popular with families. Valencia also currently holds the Spanish Formula One Grand Prix and has held the America’s Cup. Try visit Valencia in the month of March when the famous festival known as Las Fallas is held. 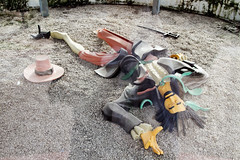 This is a week-long party with many fireworks and culminating in the burning of papier-mâché effigies of famous people. The region of Valencia is famous as the birthplace of the national Spanish dish of Paella, a delicious rice-based dish cooked in a large pan. The Valencian Paella consists of meat however all varieties such as seafood can be found in the city. Webcam in the Jardín del Turia – When the river Turia was diverted it left land which was turned into a leisure and sporting area for families. It is now one of Valencia’s largest green areas. The Playa Las Arenas webcam shows the beach of Las Arenas in Valencia from the Hostal Miramar, known for its old resort and its many restaurants, where you can sample any type of Valencian Paella. L’Oceanogràfic webcam – this Valencia webcam shows the modern buildings known as L’Oceanogràfic. This educational complex makes up the largest marine complex in the whole of Europe and is a great day out for the family. 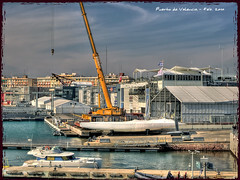 Valencia Puerto – Base Desafío Español – This webcam is located in the port area of Valencia. This area is a working port with many areas regenerated for leisure purposes due to the 2007 America’s Cup that was hosted by Valencia. 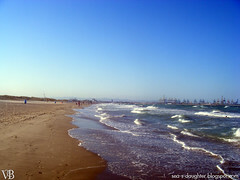 Valencia Playa El Saler – many people are unaware that the city of Valencia has good sandy beaches. The beach of El Saler in the Natural Park of Albufera of Valencia, is an ideal spot for water sports. L’Albufera of Valencia is a freshwater lake separated from the sea by a narrow strip of land, the Dehesa del Saler, consisting of sand dunes and a large Mediterranean pine forest. 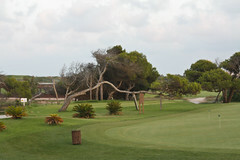 This El Saler golf webcam films one of the holes at the golf course, ranked among the top three in Europe and in the top 30 in the world. The City of Arts and Sciences in Valencia is designed by Santiago Calatrava with the contribution of Felix Candela and can be seen from this webcam, in addition there is also the Museum of Hemisfèric Prince and Sciences Philip and Oceanogràfic and the Palau de les Arts. Want to see even more of Valencia? Below is another video tourist guide to the city. Valencia Webcams – Page Summary – Above we have a quick tourist guide to Vaencia complete with webcam listings, videos and images of the city to give you a visual overview even if you have never visited there.